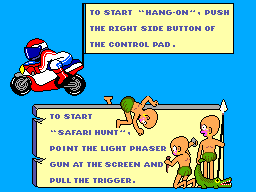 Never have I seen such a good compilation of two games as I have with Hang On and Safari Hunt. Both games are fun, and have a distinct arcade flavour to them. Since the cartridge came with all of the earlier Master System models. It's quite common, as I got one in the box for 4 dollars. Does the game hold up? Well keep reading to find out. For Hang On the goal is simple. Make it through all eight courses. Each course has 5 distinctive tracks. To get through each one. You have to make it through each checkpoint before the time runs out. It's like Pole Position with motorcycles. It sounds like it's perfect but Hang On has a few really glaring flaws that hold it back. For one, I hate how every time you touch a bike you explode. Then again that's more of a nit pick of mine. The real problem is how easy it is to accidentally switch gears. Had the Master System D-Pad not have that 'squishy feel', I wouldn't have this problem. Still, Hang On is quite enjoyable. Safari Hunt is shooting action at its best. It's WAY better then Duck Hunt in several ways. There is a lot more variety in Safari Hunt. You have 3 locations and plenty of unique targets to shoot at. What's the goal? Well your goal is to get enough points to qualify to the next stage. You have a limited set of bullets so use them wisely. I really don't have much else to say. Its a great light gun game with no flaws. 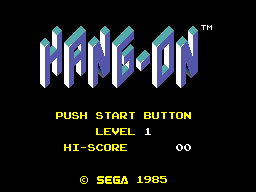 Hang On's graphics are mediocre at best. While the objects scale in quite well, the sprites are tiny and have awkward colors that don't look very good. On top of that the backgrounds, while distinctive, lack detail. Safari Hunt's graphics are not bad. While they are simple, they are bright, colorful and easy on the eyes. The game manages to be detailed yet simple. The visuals could be better but they are not bad. There isn't very much music aside from the title screen and end of course tune. The sound effects in the game are quite good. They sound real by Master System standards. There isn't much music, aside from the intro and end of rounds screens. The sound effects are not that good. Then again you don't need good sound to make a good game. My problem with accidentally changing gears can be fixed by using the Genesis controller. Other then that though, the game controls quite well turning is a breeze, and I always feel in control of my bike. The Light Phasers accuracy isn't perfect but it's quite good compared to the mediocre Nintendo Zapper. I really have nothing else to say. Hang On - Grade A Once you beat all 8 courses, you can go to a harder difficulty mode. Or play for a high score. It's quite fun to play again, and again, and again. You can play for high score, overall Safari Hunt never gets old. Both games are fun and addicting. 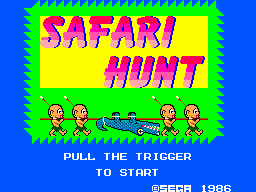 Safari Hunt is a bit better then Hang On but I still enjoyed the overall package.